Over a year has rolled by since our last post in February 2015. The previous post was March 2014—another year span. This timeframe may have become normal for us. It seems the days stream past so very quickly now. Our apologies should you be expecting more frequent updates. Looks like they won’t happen. Rest assured, Zuzu and Miss Trilly are still transporting us in style to many adventures and beautiful places. Our journey this Winter took us first to Pinnacles National Park, around the Monterey Peninsula via San Juan Bautista, and south on Highway 1 to Plaskett Creek, Big Sur, a National Forest Campground. The wind blew gale force and it rained heavily. Thankfully, our campground was well sheltered and uncrowded—folks who had made reservations stayed away. We visited Hearst Castle during drizzly rain and watched Northern Elephant Seals at the rookery near Piedras Blancas Lighthouse. Continuing south along the coast, our campsite in the oak-studded hills of Cerro Alto, another Forest Service facility, proved very convenient to Morro Bay and San Luis Obispo. Morro Rock, the Elfin Forest, and Los Osos Oaks are as Nina remembered them from the early 1970s—unchanged. San Luis Obispo, on the other hand, had grown so much it was nearly unrecognizable! Staging to view the Rose Parade Floats at the post-parade venue, we camped at Wheeler Gorge above Ojai. We found the local library handy for wi-fi, but the room was cold as a walk-in meat locker! We left the campground before dawn in order to arrive in Pasadena by 7 am, hopefully before the crowds. We parked Miss Trilly at the Rose Bowl Stadium (free) and rode the shuttle ($3 round-trip) to the display. Tickets to view the floats are only $10. We were surprised by the numbers of people at this early hour! The weather was perfect, but the crowds made photography difficult and we did not appreciate the loud music that blared over closely spaced speakers. Three years ago, we enjoyed nearly unencumbered viewing of these marvels of floral creation. It was grand. East of Pasadena, the only campground we could find within reasonable distance was Rancho Jurupa, a county park in Riverside. It was brown, dusty, photographically a disappointment, and $30 per night! We seek out federal areas where we can camp for free or use our Senior Pass for its 50% discount. Thus, we rarely pay more than $10. The weather forecast heavy rain, so we drove on next day to Joshua Tree National Park where we knew it would be beautiful, whatever the weather. We were not at all disappointed! Yes, there were torrents of rain, dense fog, and it was very cold, but Miss Trilly is incredibly comfortable. Her original propane heater works very well and her large windows afford wonderful views. A dear friend, who happened by looking for a campsite for his Aliner, found us sheltering inside our little “egg.” Next day when the storm broke, we all hiked together and photographed the unique rock formations of the park. From Joshua Tree, we drove to the BLM 14-day area known as “Roadrunner” south of Quartzsite AZ. We did our laundry and took $7 showers at Main Street Laundromat & Showers. It is a great meeting place for RVers! 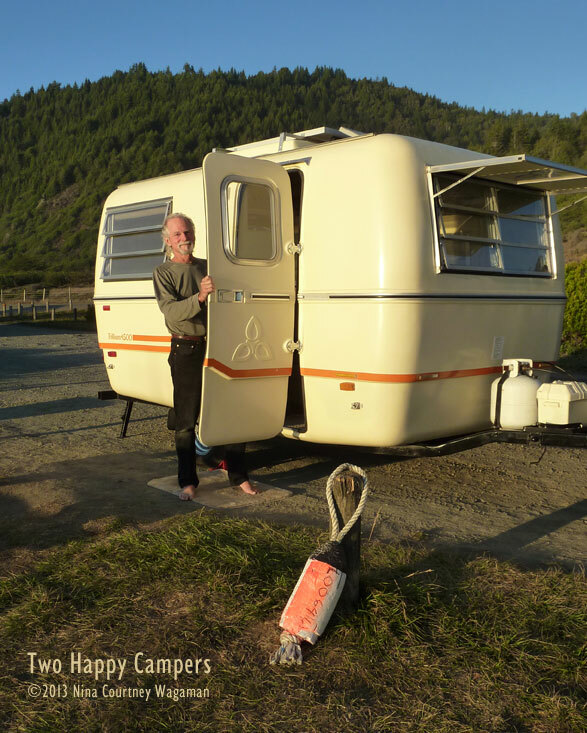 After two nights, Zuzu towed Miss Trilly 100 miles farther south to another BLM dispersed camping area off Ogilby Road in California. One of the reasons we traveled so far south this trip was not for sunny, warm days, but for dental work. Over the years, several Snowbirds, both Canadians and Yanks, have told us that the dental services in Mexico are both very good and very inexpensive. With a couple of referrals, we began doing research from the library in Yuma AZ. We were astonished to learn there are over 300 dentists within the five-block area of Los Algodones adjacent to the border. We checked out the border crossing into Mexico and the $6-per-day parking area run by the local Quechan tribe of Native Americans. It seemed very easy—folks were simply walking into Mexico from the parking lot with no check-in required and walking back out through US Customs. As a way of acquainting ourselves with the “procedure” of crossing and navigating the streets of this bustling town, which is not only crammed full of dentists, but opticians and pharmacies too, we made an appointment for free exams with a dentist whose website claimed to offer same-day Cerec crowns. Nina had one of these ceramic crowns done years ago in Sandy, Oregon. At the time, she paid $1200 for the tooth-colored crown, which was carved by water jet as she watched! 3D-imaging instead of impressions, cutting of the crown itself and its installation—all done in less than an hour and a half! Tumco Ghost Town, Miss Trilly off in the distance. On January 12, we crossed early, sidestepping the many hawkers offering dental and optical services. “Crowns $130 dollars! Free exam! Free x-rays! New glasses only $30! Get a second opinion! Best price!” Every few feet a hand thrust our way with a flyer or business card, the fellow claiming, “We’ve been waiting just for you!” Looking lost, we were offered help by several folks. After failing on our own to locate the address of our appointment, we accepted help. Our benefactor phoned the dentist’s office. Shortly, a nice-looking woman arrived on foot to lead us there. In the very tiny clinic, everything was shiny, clean, and new. Our mouths were examined very quickly (and superficially) by a dentist who spoke only Spanish. He took digital x-rays only of the teeth we felt needed treatment. Clark had one problem tooth, but his recommended “treatment plan” included six crowns and a root canal! Moving on to me and my two problem teeth, the dentist examined the x-ray of a lower molar that had been broken for a decade. He made a phone call. Less than ten minutes later, a specialist arrived to pronounce (in Spanish, of course), “It needs to come out!” In addition to the extraction (to be followed by an implant or bridge), I was advised several more crowns were needed. They were prepared to move ahead with the procedures immediately! We had chosen this clinic because their website stated Cerec was offered, but the staff had no idea what Cerec was. So we said, “We need to think about it.” and asked for copies of the treatment and prices. They had no copy machine, so they led us to a main clinic just few blocks away. We were a sight—the receptionist, Clark and me, the dentist himself and the specialist—all parading through the colorful confusion of the streets of Los Algodones. The fellow who had helped previously offered Nina a free second opinion from the dentist he represented. This dentist took another x-ray and said, “Yes, there is decay, but there is no emergency, ” and handed us the film. Out on the street once again, we resumed searching for the Cerec dentist. Finally, another very nice young man led us directly to his office. There we learned that this particular dentist does his own lab work and is the only “game in town” offering Cerec technology. We picked up a price list and made appointments for exams. Standing in line waiting to check back into the US, we felt fairly confident that we could take care of our dental needs while saving ourselves some money. We were camping for free, after all, and the costs for procedures seemed about one third of what is typical in the US. In Los Algodones, implant prices range between $700 and $800, plus $400 to $500 for a zirconium crown and abutment. Things were looking good so far. Before beginning dental procedures, we took two side trips, first to Cibola NWR, hoping to photograph birds. Sandhill Cranes, Snow Geese, and several kinds of ducks were there the first day, but on our second day they had all but disappeared. Hunting season opened—in a Wildlife Refuge!? We were camped at a BLM “fee area” on the Colorado River called Oxbow, where the sounds of gunfire punctuated the air. We also fled, stopping at the dispersed camping area at Tumco Ghost Townsite off Ogilby Road. 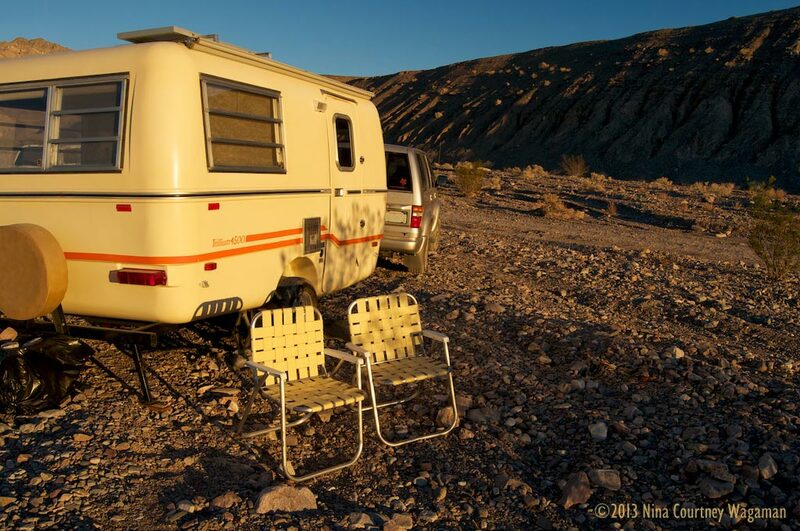 After a couple of nights, we were off to Anza Borrego Desert State Park. There, we joined a couple that we met at the Elephant Seal rookery north of San Simeon. We enjoyed a lovely evening around the campfire swapping stories and getting to know each other. We hiked Palm Canyon, where we saw two Bighorn Sheep, then drove out to camp along the dirt road leading to the very popular mud-walled slot canyon called, aptly, The Slot. Because we were so close, we enjoyed unhampered photography for an hour before a troop of Boy Scouts came running through. Looking for a new campsite off Ogilby Road, we turned up the wide dirt road leading to American Girl Mine. As we came around a curve, we spotted two vintage Boler fiberglass trailers. We decided to set up a comfortable distance away along the wash. We met both couples and, over the next two weeks, shared “happy hour” chats in the afternoons. Our spot was but a short drive to the Quechuan parking lot and we could pick up a good cell signal. On January 14, we began our dental treatments in Los Algodones. At first, we were quite impressed with the Cerec dentist. His English was good and he took time to explain things. Patients in his waiting room offered endorsements of his skill, his perfectionism, and their satisfaction with the results. One couple had been seeing him since 2007, driving all the way from their home in Idaho. The wife had twelve implants, all successful. They were happy patients. Ultimately, we made seven trips into Los Algodones over five weeks for our treatments. We each had a molar extracted, then bone grafts, all in preparation for receiving implants. We could return for crowns six months later. Nina had an implant placed, Clark did not. Our experience, to put it succinctly, differed greatly from the patients we met in the waiting room. Our association with this dentist ended bitterly. We thought we had chosen well with the Cerec dentist, but things went horribly wrong. There were signs. We regret that we did not walk away when the red flags first started going up. Such is life. We learn. Now back in Sacramento, we are each undergoing treatment to repair and replace all the work done in Mexico. Clark’s bone graft failed. My bone graft and implant also failed. The local dentist we are now seeing is highly skilled, thorough, and very attentive. The atmosphere and our experience in his chair is vastly superior to what we were put through in Mexico. Now, we each have fresh bone grafts and a four- to six-month waiting period before implants can be placed. This is the best experience we have ever had with a dentist and we are grateful for it. Nearly twelve months have rolled under Zuzu’s wheels since we last posted an update. It is plain we have some catching up to do! For six of those months, Miss Trilly was lounging in her Summer Palace in Oregon while we floated around British Columbia on our boat. Zuzu is our tow vehicle, of course. Our ’99 Isuzu Trooper serves in other ways when not towing Miss Trilly. 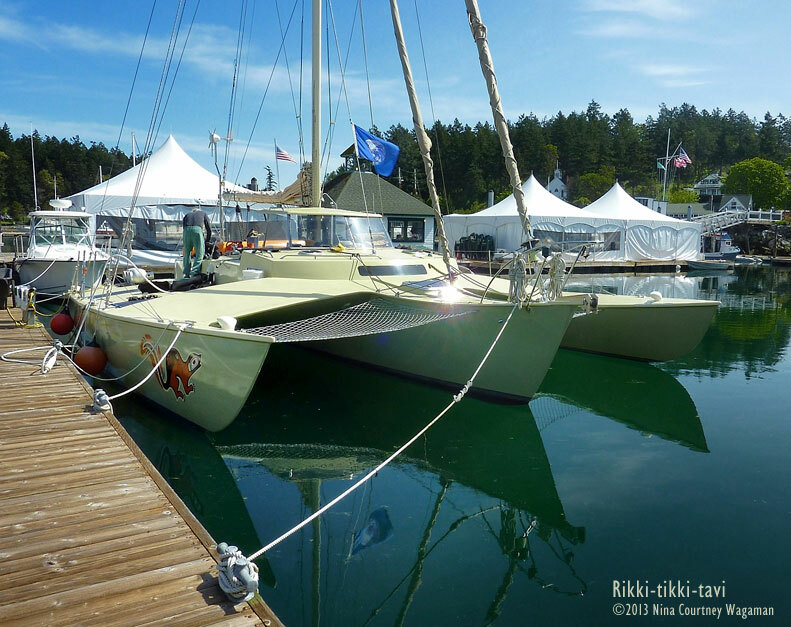 He hauls gear to Roche Harbor, Washington, where our boat is moored October through April, and back to California in the Fall once we’ve put Rikki-tikki-tavi to bed after a season of cruising. So, once again, we apologize for the time away from chronicling adventures with our vintage Trillium. Within a few weeks of retrieving our sweet girl in October, we set off for our annual winter exploration on land. Departing for points south and east on the day before Thanksgiving, we returned over six weeks later on the eleventh of January. Zuzu wheeled us over roads, mostly paved though some not, for a total of 4,244 miles–all the way to White Sands NM and back! The route we chose was our own impromptu version of the popular American Southwest Grand Circle Tour, though it is less popular with travelers in the winter for obvious reasons. It is cold in the high desert! We are now immersed in cataloguing over 4,000 photographs, choosing our favorites, and decreasing the number suitable for sharing. Soon, new photo albums for this season’s travel will be added to our Winters Are For Wandering website. In the meantime, we have created a Google Map of the places we visited. Enjoy the tour! First, my apologies, friends, for the months that have slipped by. Miss Trilly has been parked in the driveway since January 8th, the day we returned from our very wonderful Southwest Road Trip. She is merely biding time until April, when we tow her to the Summer Palace in Oregon. We, on the other hand, are enjoying warm Spring days doggedly working on various projects. There remains much to do before we head north. Clark has engaged himself in building an HHO system for Zuzu. He is very intrigued by the prospect of increasing gas mileage and engine power by generating hydrogen gas under the hood. Inspired by a bloke we met in Pahrump, Nevada, he researched the details and located the required components. He is nearly ready to complete the installation. As for me, my time initially was soaked up organizing our photos and completing a website focused on our last three years of land travel. Now I am collecting loose ends and getting back to things that were put aside while I finished the website (begun last winter!). We thoroughly enjoyed traveling with Miss Trilly! It is hard to express how pleased we are with everything she is. We encountered very few issues, a propane leak (yes, again) being one of them. Finding the source was difficult. We did find that one of the new valves in the stove was leaking. Fortunately, I remembered where I had stowed the old valves and Clark exchanged it. Still, propane was getting away from us for the duration of the trip. We elected to buy an extra tank, which is how we found ourselves at Shoshone Propane in Pahrump. A 1999 Isuzu Trooper just like ours drove in right behind Zuzu. Its driver called us over to show off what was under the hood–an HHO system that he had built. He raved about the enhanced performance. As a result of this encounter, we will be driving an HHO Trooper soon. 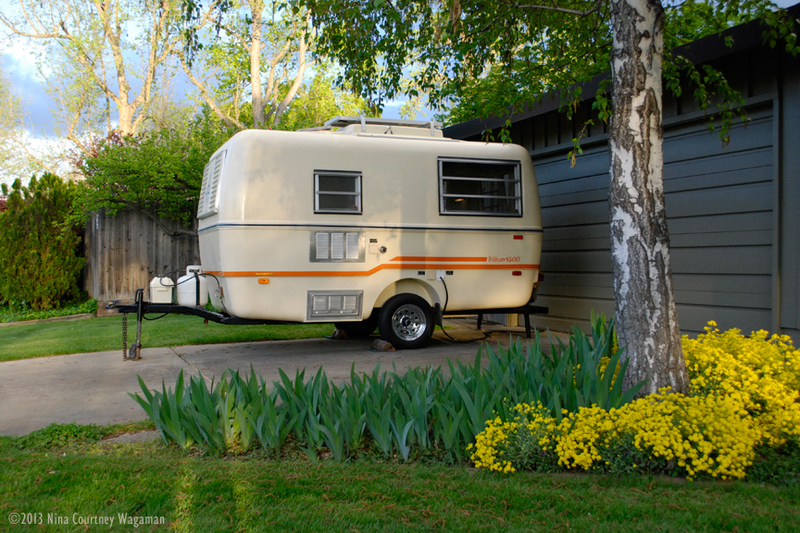 Back in California, Clark spent days tracing propane leaks in the trailer. There were several. He ended up replacing all the flare fittings and installing a solenoid valve to turn the gas off at the stove when we aren’t using it. I am excited about a certain delicate topic (if one can be excited about such a thing) in which a few of you may be interested. We have been using a composting toilet on our boat since we launched in 2004. We would not consider using anything else. It works great and we never dump effluent into the water. Miss Trilly is graced with a porta-potty, which most small trailers her size lack. I love not having to traipse to a campground facility or squat in the woods. However, a portable toilet has a very small capacity, which limits our time away from a proper dump station. To solve this problem, we are designing and building a micro-size composter that will replace the water-filled porta-potty. We nearly had it ready to go before the Fall Road Trip, but were missing the urine diverting part. For the trip, we reduced the amount of liquid going into the portable toilet by using a 97-cent long-nosed funnel in partnership with a 1.2-gallon flexible plastic bag with screwcap. This bottle is similar to the flexible drinking bottles you may have seen, but is larger and has a base which spreads to support the bottle. Its built-in carry handle makes it easy to transport to a nearby shrub. The flexible bottle will become part of Miss Trilly’s composting toilet next Fall. It will be a marked improvement over the porta-potty. I also bought a GoGirl, which goes with me on hikes. We keep a second flexible bottle/long-nosed funnel in Zuzu. We did not want our journey with Miss Trilly to end. She was a perfect lady! Clark and I are already looking forward to more distant destinations, Southeast Alaska perhaps, with our sweet gal following closely behind Zuzu. This trip, we made it to the South Rim of the Grand Canyon (our first time!) and to several areas we had not yet visited. 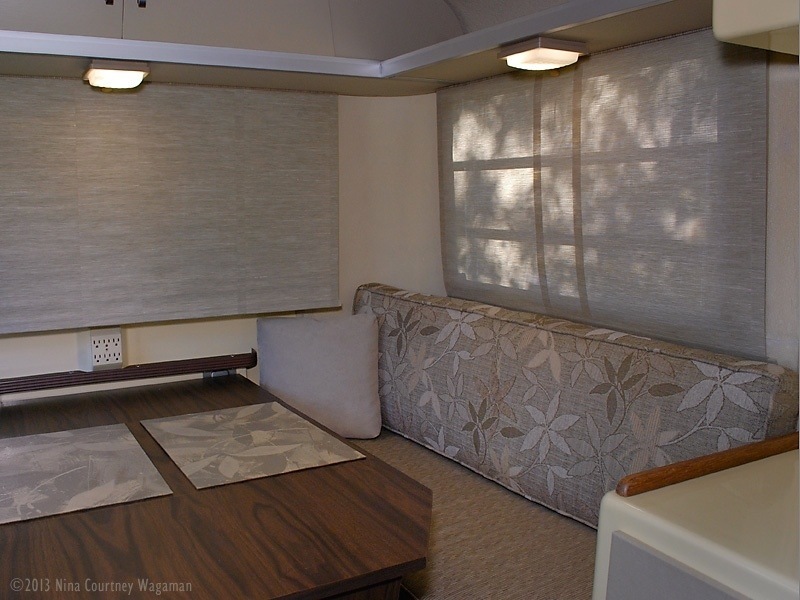 We reveled in the luxury of propane heat, a comfy bed, a convenient galley, and solar power for our lights and for charging the iPad and cameras. The large windows are wonderful–we often found ourselves lounging on the bed and contentedly gazing at the view. We are totally pleased with the size and ease of Towing Miss Trilly! Regretfully, fellow travelers, I cannot devote more time and attention just now to recounting the details of our Southwest Wanderings. In place of my personal narrative, please visit our website… Winters Are for Wandering–2013. May all your journeys be as wonderful as your dreams! October 6— We had been on the go since o’dark hundred, having awakened before five a.m., even before the iPod alarm sounded. There were last-minute details to wrap up before we locked our boat’s companionway drop-boards for the final time until next spring. The Washington State Ferry departs from Friday Harbor each day at 8:05 and we wanted to be on that sailing. Clark and I had spent the previous nine days preparing our trimaran, Rikki-tikki-tavi, for his long winter sleep at the dock. The weather had become enjoyably mild after the first two days of blustery wetness following our re-entry from British Columbia on September 27th, which allowed us to take care of decommissioning chores in good order. Between the 27th of September and October 5th, Clark borrowed a hooka, dove under the hulls, cleaned the metal parts and replaced the prop shaft sacrificial anode. We stowed gear, dried out the mainsail and removed it from the boom. I packed the sailcover to take back to California as a pattern for constructing a new version, which will also be of the sort that catches the sail as it is lowered. We also demounted our wind generator to take with us as the Rutland had developed a noise in its bearings. We removed the covers off the settee seat cushions and the complete back cushions for cleaning and revamping. We managed to get in a few visits with friends during those frenzied days, too. By the time we were ready to leave, the Trooper was packed very, very full. Confident that we had not missed anything of great importance, we drove away from the marina toward the ferry landing on the other side of the island. On the road, enjoying yet another sunny day, we stopped at the Costco in Clackamas, Oregon, to buy a battery for Miss Trilly and a couple of rotisserie chickens for dinner with family in Estacada. Finally, in the fading afternoon light, we had returned to our sweetheart Trillium trailer. We greeted family and sat down for some conversation to catch up on things. Because rain was to arrive overnight, the decision was made to hitch our lovely lady to her tow vehicle, Zuzu, before dinner and move her to the driveway. She followed the Trooper obediently, leaving the protection of her Summer Palace. Dan and Clark took the vinyl off The Palace for dry storage over the coming winter months. Clark and I had been excitedly looking forward to the places we’d see during our first real land adventure with Miss Trilly. There was just a tiny problem… all the federal lands were closed to visitors. This meant no Yellowstone, no Grand Teton or Glacier to visit, no BLM lands or forest service campgrounds to stay in. Choices for sightseeing and camping would be limited to county parks and state parks. Our budget and our proclivities for more out-of-the-way places did not include private campgrounds. So, we sat down with the maps and brochures family had so thoughtfully collected and deliberated on the possibilities for routes and campsites. Miss Trilly was ready. We were ready to see some new territory. Where should we go? We spend the majority of our time on the water, exploring the inner coast of British Columbia. We see a lot of saltwater, barnacled rocks, and green trees. After a while, it all starts to look much same. Clark and I were hunting for some scenery done up in colorful earth tones, so we chose a route through the rugged, arid center of Oregon. We would travel north and east past Mount Hood to the eastern side of the Cascade Range. Our drive would take us to the valley of the Deschutes River, which is contained entirely within Oregon, emerging from Little Lava Lake near La Pine. It flows north, passing through Bend, then onward to its confluence with the Columbia River a few miles southwest of Biggs Junction. 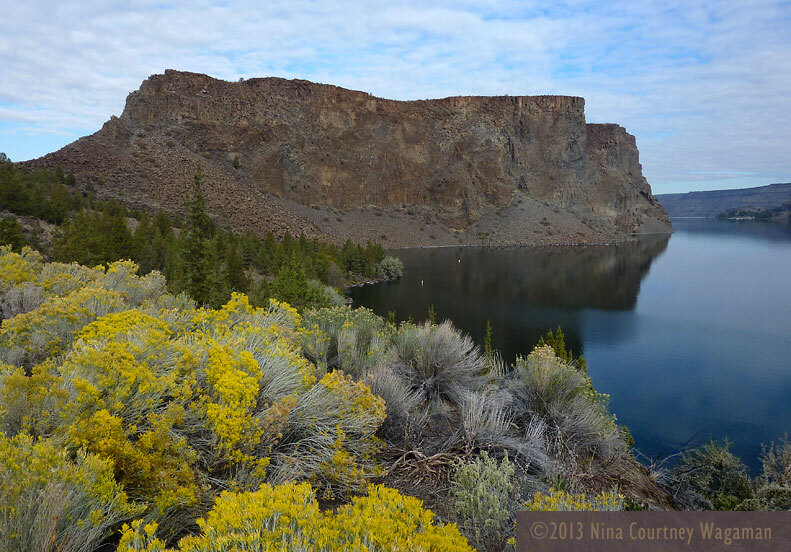 Near the town of Madras at Billy Chinook Lake, the Deschutes is about 300 feet below the surrounding plateau. Established there is a state park named The Cove Palisades. The photos in the brochures showed interesting basaltic geology, so we chose that campground as our first stop. Mount Hood in the distance–The Cove Palisades State Park. The campground had been whittled down to one loop, all with full hookups. The camp host informed me that we must pay the $21 hookup price even if we chose not to use it. All the tent sites for $16 had been blocked off, so we plugged in. In the photo above, we are parked along the road that descends to reservoir level from the campground perched on the basalt cliffs above. This part of the Deschutes River is an interesting area, but we were glad to be there in the uncrowded shoulder season. Observing the launch ramps, mini marinas, and large parking lots, it was evident that the lake was heavily used during the summer. As you can see below, there was no activity on Billy Chinook Lake during our visit. Next morning, we drove to Bend to fuel up and make a quick stop at Trader Joe’s for provisions. Our goal was another state park down Highway 97 called Collier Memorial. I had used our iPad to research the Oregon State Parks website, making sure that the parks were open for camping. Because prices were posted on the Collier camping rate page for the time period of October 1 to April 30, stating that a tent site was $14 and that full hookup was $17, I assumed that we would be able to stay there on October 7. We made the left turn off 97 and were stunned to encounter a gate across the campground entrance. A sign read “Closed for Winter.” Now what? The casino parking lot eight miles farther along? That option sounded dreadful to us. We were on a Forest Service road and our 3G service on the iPad was working, barely. 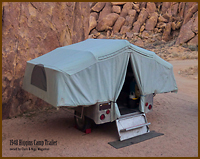 An app we use extensively, AllStays, indicated there was a Forest Service campground just down the road a short way. It was closed, right? We had already turned around and were about to head back to the highway when a pickup truck turned in. A young man with a dog pulled alongside to ask if we needed assistance. He told us that the USFS campground was open, though the water was turned off. He noted, however, that the toilets were not locked and that he would be heading there shortly. 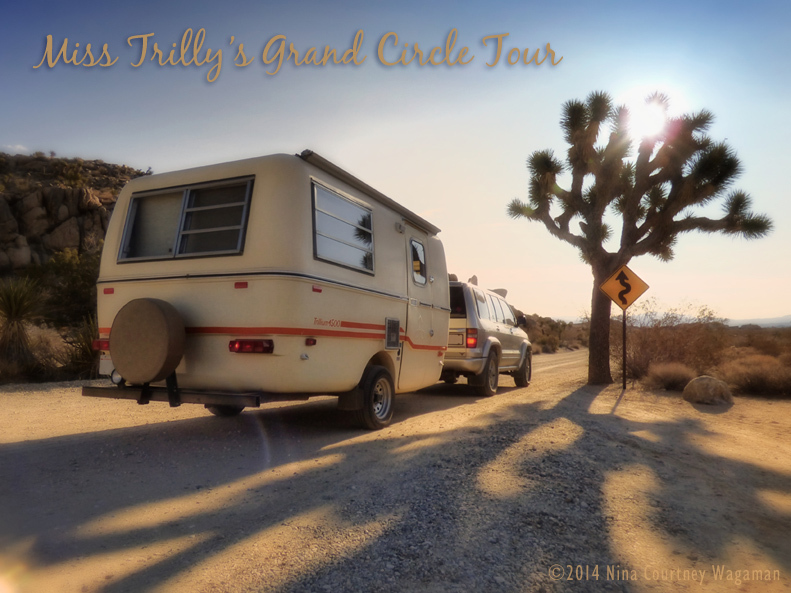 So… we turned around yet again and drove down the gravel road to Williamson River campground. Over our afternoon ritual drink, we discussed whether to stay and risk being asked to move long or move along and risk not being able to find another camp spot. How comfortable did we feel with each choice? There was another state park a bit up the Crater Lake highway, a primitive campground with only ten sites, that was open through October 31. We could either drive there or stay put. It was very quiet at Williamson River Campground–a bit too quiet, perhaps. If something were to happen, there was no way we could call for assistance or alert someone nearby. We decided to leave. On the road out, we crossed tracks with a couple in a VW Westfalia. They passed us, but Clark stopped. The Westie stopped too and backed up to meet us. We asked about the USFS camping. The couple said they had stayed in the campground the previous night and they would stay again that night. We then felt more comfortable–someone would be nearby in case of need. The problem then became that of turning Zuzu and Miss Trilly around yet again on the narrow gravel road. Clark managed the task with aplomb, with only two or three attempts. We chose a spot within sight of the VW, but far enough away as not to intrude on their privacy. Later on, two other campers arrived to share this “closed” area for the night. Tell us where to go next! Settling into our new spot, we turned on the propane again and tried to light the fridge, but it simply refused to fire. The 34-year-old Dometic failed to work on 12volt setting too. Darn! Clark had tested it for a couple of days back in Estacada. What had gone wrong? Not having the fridge was very inconvenient. Another concern, besides losing our frozen food, was finding places to camp. Along routes south into California and/or Nevada, most sites are federal. What to do? Commiserating, Clark and I decided to turn westward toward the coast. For the time being, we had finished with earth tones. Decision made, we enjoyed the Ponderosa pines and the peacefulness of the area. No fumes or generators, perfectly quiet. We slept like babies, serenaded many times by choruses of coyotes. Last to leave the following morning, we stopped at the casino for fuel, then headed up the Crater Lake Highway. Knowing we were prohibited from stopping at the National Park was a huge downer. We resolved to come back at another time and settled back to enjoy the scenery along Highway 92. The traffic was extremely light, which made the driving that much more pleasurable, though it was distressing to see so many “Closed” signs along the way. 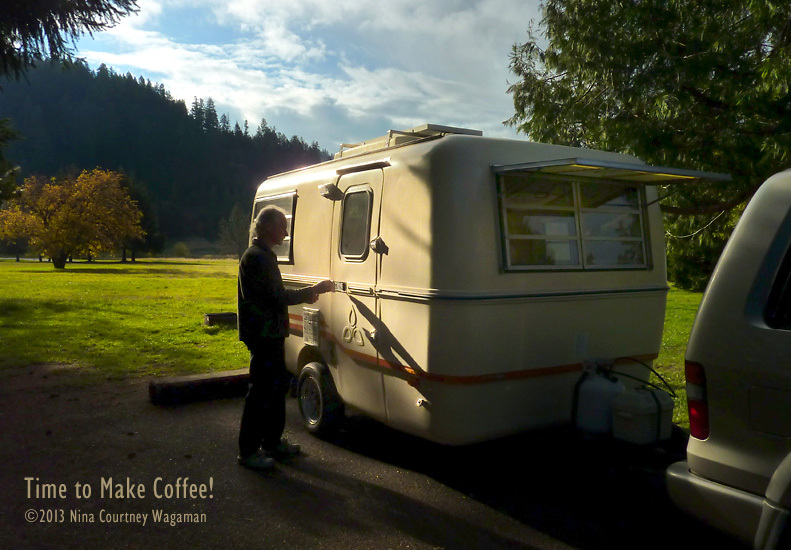 Just shy of Medford, we stayed at another Oregon State Park–Joseph H. Stewart Recreation Area. Situated on another reservoir, we found the campground a bit crowded with motorhomes and fifth-wheels, but most folks were quiet. We stretched our legs, enjoying the balmy late afternoon light. Clark and I couldn’t help but notice the humongous nature of the vehicles people camp in these days. There was only one other small fiberglass trailer, a Casita, and the gent who traveled in it with his wife came by to spend some time with us. He was chock full of information! The restrooms, though, left something to be desired. One would think that a Camp Host’s duties includes more than just dumping the trash and sweeping the center of the floors. Next day, we stopped in Medford for fuel at Costco and a new 2014 Rand McNally Road Atlas at WalMart (only because WM was convenient) AND some ice! Clark transferred frozen food to a cooler and we continued onward. 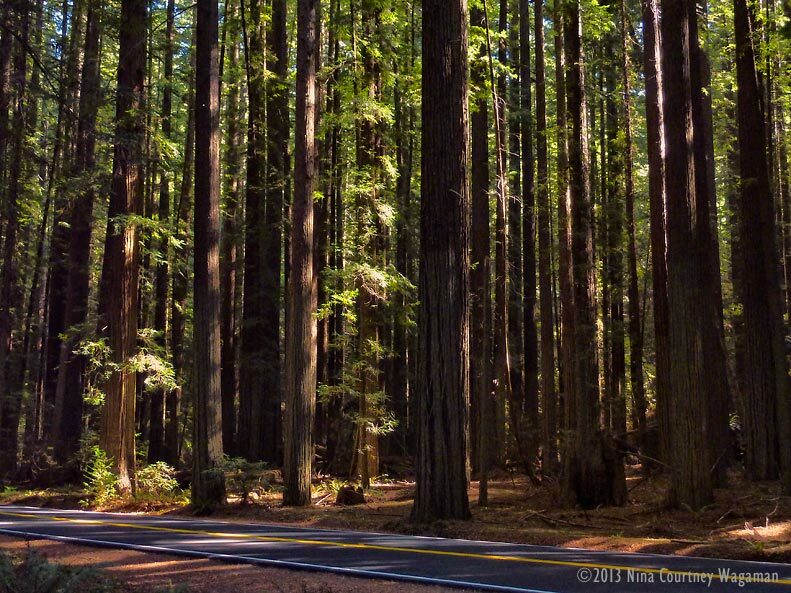 Our route toward to coast took us on The Redwood Highway, Highway 199, which runs 80 miles from Grants Pass OR to Crescent City CA. Again, it was a road worth driving simply for its beauty. I enjoyed all the hairpin turns and curves, though negotiating them was tiring for Clark. 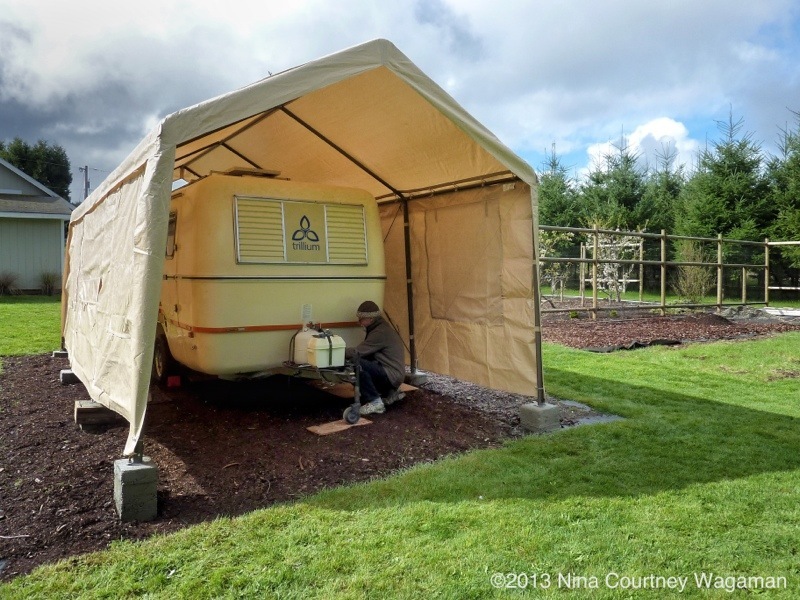 We chose a Del Norte county park in which to spend the night–Florence Keller Regional. It was a dark and wet little area located off Elk Valley Cross Road at the intersection of Highways 99 and 101. We parked in #3 in this small section of second-growth redwoods. Redwood forests just smell good, which was a relief since the restroom in this park was horrible! Country Western music was playing somewhere in the back of the very rundown building and the facilities were not what we could call sanitary. I asked Clark to accompany my visits even though the Camp Host was just a few yards across the narrow road. The host’s site, with its mobile trailer, was crammed with what appeared to be many years’ worth of collected “stuff”–a veritable junkyard. It left us wondering where our cash camp fee would end up. Florence Keller Regional Park in Del Norte County. As Zuzu carried us through Crescent City the following morning, we spotted at least a dozen very spiffy classic cars taking part in a car rally. Very fun! We aimed for another county park on the Samoa Peninsula, which is a coastal bar that once separated Humboldt Bay from the Pacific Ocean. It is across from the city of Eureka where we had overnighted Rikki-tikki-tavi in the Woodley Island Marina on our “sail” up the coast in June of 2005. This time, towing Miss Trilly and traveling on the land, we stopped at one of our favorite places, the precious town of Trinidad, to wander down the pier. We bypassed several lovely North Coast California State Parks–specifically Prairie Creek Redwoods and Patrick’s Point–because of the high camping fees. This region of California is one of our very favorite environments, but we simply cannot accept paying $35 to $45 per night to camp. Samoa Humboldt County Park Campground is much less expensive, but it is an unsightly gravel parking lot. There were flush toilets and free showers, but we won’t stop there again. 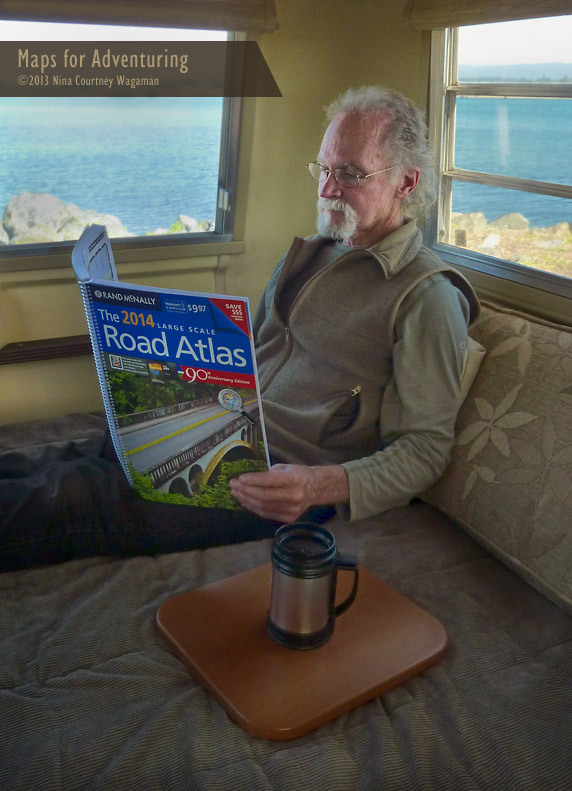 An expanse of Humboldt Bay outside, Clark studies our new road atlas. 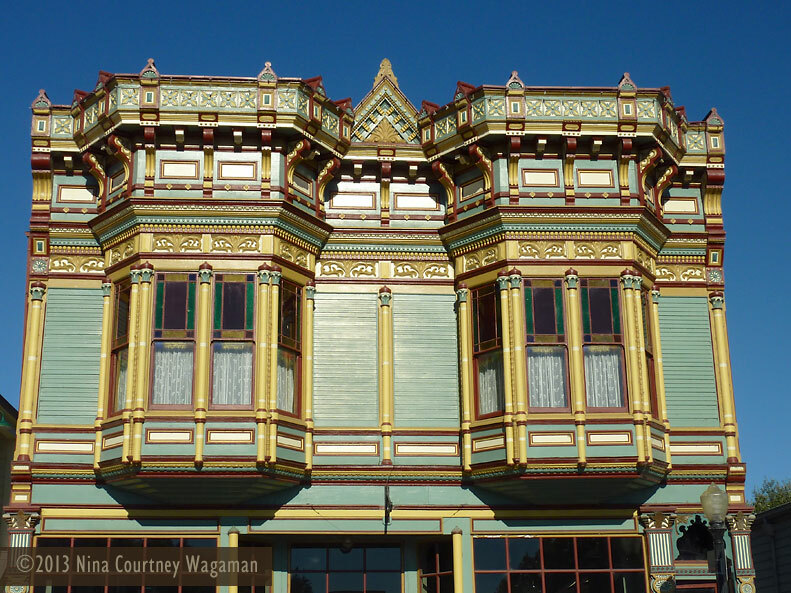 Continuing south from Eureka, we made a side trip to Ferndale, with its Victorian Village and small-town atmosphere. The ornate buildings are pridefully kept and we strolled up and down both sides of the main street. This very quiet town (at least when we were there) is very pleasantly surrounded by pastoral country. Driving on, we left Highway 101 to meander along the Avenue of the Giants, which is a 31-mile portion of old Highway 101. Next trip, Clark and I will get out and hike. I am recuperating from a broken toe and torn ligament in a knee. It is a shame that we weren’t able to get deep into the stately and beautiful groves of tremendous Sequoia sempervirens. We were forced back onto 101 due to road construction. At Leggett, we bailed off the freeway to pick up the coast road, the famous Highway 1. There were only state park and private campgrounds within reach. Would we want to pay $35 at MacKerricher SP or $25 at Westport-Union Landing SB? MacKerricher is a very nice park. We have visited many times in the past before the prices went crazy. Ten dollars buys a bit more than a couple of gallons of gas, so we stopped at the roadside primitive (pit toilets) site of Westport-Union, just north of Howard Creek. We discovered that seniors get a generous (?) $2 discount, so I wrote a check for $23 to park on the bluff above the waves. The weather could not have been more beautiful. 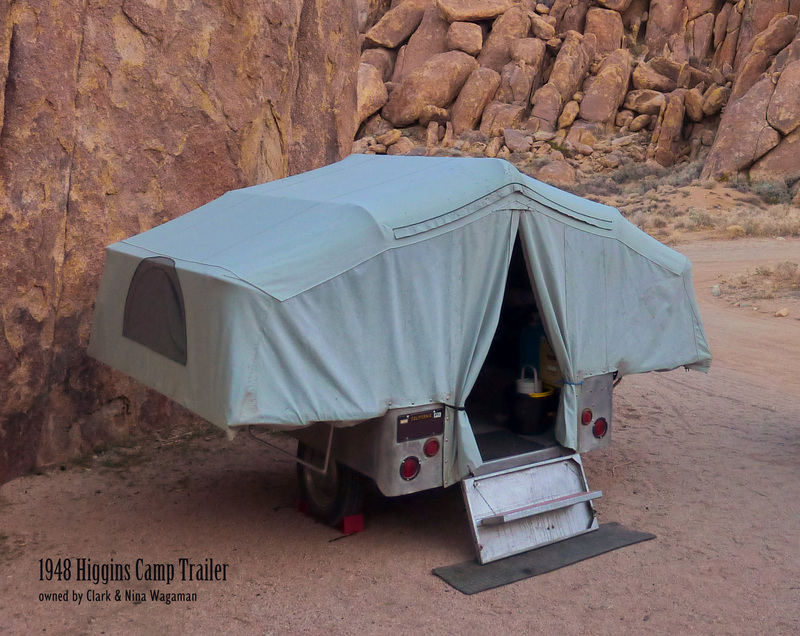 We met a couple who were camping in a new R-Pod with slide-outs. Larry told us the trailer had two big-screen TVs and a pet iguana that had to be kept at 90˚ constantly. Miss Trilly’s spot at Westport-Union Landing SB. The waters of the Pacific Ocean were mesmerizing and, well, pacific. We could envision our trimaran sailing past this coast in weather such as this. We would be motoring, of course, as there was no wind to ruffle the sea or propel a sailboat. In 2005, rounding Cape Mendocino from our overnight anchorage in Shelter Cove, which was within sight, the sea was as flat as glass. We could peer into deep blue of the Mattole Canyon! We sighted many sunfish and thousands of by-the-wind sailors, even a couple of puffins. From our current vantage point above the soft surf, we enjoyed our afternoon java, then watched the sun slowly “sink” into the horizon, the golden light reflecting off the washed sand below. Sublime. In the page headers, you will see a view of the Trinidad pier with fishermen, another of the line-up of campers at Westport-Union (Miss Trilly is visible if you look for her), and one of our Zuzu and Miss Trilly parked on Little Lake Street in Mendocino. Of course, we spent a few hours wandering around the lovely town of Mendocino, enjoying the art galleries and bookstores. Then, we stopped for fuel in Fort Bragg and a driving tour down to the harbor of Noyo, where we had spent eleven days in June of 2005. Such excitement we had back then–a USCG inspection, frightening sea lion encounters, a tsunami alert scramble, hiking across the bridge into Fort Bragg against a gale wind. Happy memories include a steak dinner and rock jam session with a new friend, many fun and inexpensive bus rides to Mendocino, and meeting the delivery crew of a motor yacht who introduced us to Saint André cheese (OMG!). 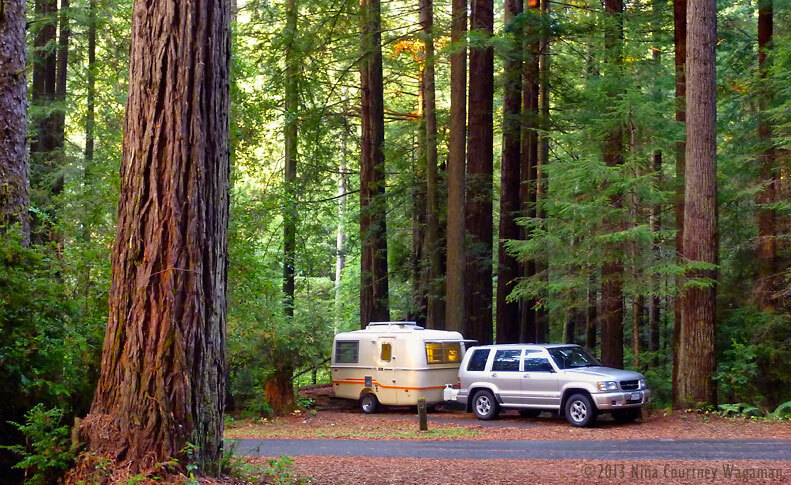 We thought we might overnight at the Navarro River Redwoods State Park, but we did not want to park in another gravel lot like we found at Navarro Beach, so we drove to $25 Paul Dimmick Campground–and found it CLOSED! Phooey. Hendy Woods SP eight miles northwest of Boonville is an outrageous $40 a night, so we continued to tiny Indian Creek County Park in the tiny town of Philo. We are fans of community public radio (our favorite is KVMR in Nevada City). Philo is home to KZYX and we tuned in. Indian Creek has only ten sites, but the place was empty. A bobcat came strolling down the road soon after Clark got the trailer leveled, but it spotted our movement and trotted off in the other direction. There were no pay envelopes and nobody came to collect–another free night to offset the more costly stops. The smell of propane emanating from the new regulator was getting stronger, so Clark replaced it with the old original unit. Hooray, no more odor! Driving east on Highway 128 next day, we were astonished to see how many vineyards have been “installed” on the hills in the Anderson Valley since our last visit in 1987. Incredible. Do we really need to plaster the planet with wine grapes? In Calistoga, we parked at Pioneer Park and took a jaunt down the main street. I ambled around a consignment shop while Clark checked out a gourmet kitchen store. We briefly contemplated getting spa treatments at famous Doc Wilkinson’s, which we had experienced many years ago. Best massage I’ve ever had! We had visited Harbin Hot Springs on our honeymoon and enjoyed it very much too, so I checked on their offerings using my iPad. Because the weather was so perfect, it was very tempting to stop for another day or two, dragging our feet. The rates and facilities at Harbin were quite inviting. In the end, we chose to continue driving east to Sacramento. We enjoyed cruising the back roads past Lake Berryessa. Miss Trilly and Zuzu were parked in front of the house before three in the afternoon. Time for coffee! Until our next adventure, happy travels! Addendum to fridge problem: Clark discovered a missing pin in the connector between the control selector knob on the face of the fridge with the actual fuel selector inside the unit. A bent-on wire served as a quick and free repair. Clark later became suspicious of the accuracy of the thermostat, especially the propane side, as he monitored the temperature on different cold settings. Subsequently, we installed a new one. That cost $100. I have no complaints. Clark is the cook. Enough said. The weeks of seemingly nonstop tasks are finally at an end. Miss Trilly is snug in her Summer Palace in Oregon. We left her with caring family on April 16th, continuing north without her trailing behind Zuzu. It was sad to be parting without having time to fully enjoy her fresh new look, but she is packed for camping and ready for our return in October. It is our plan to head northeast from Oregon on our first big journey together. We are excitedly looking forward to an extended trip to parts of the country we haven’t yet explored. Miss Trilly has a new lease on life as an able traveling companion, all dressed up with places to go. She (and we) will be waiting patiently until then. Some details… The window shades are what I guess is known as an IKEA Hack (there is a website devoted to projects using IKEA products in unique ways). I used beige Anno Sanela curtain panels, which are made of paper and look like fine grasscloth. Only fifteen dollars apiece, three were more than enough to make shades for all the windows. I sliced up the 23.5″ x 118″ panels with a rotary cutter and glued them back together with the wonderful adhesive from Beacon, Fabri-Tac. The shades roll up by hand and fasten to a large wooden bead attached at the header with a single loop of cord, crocheted out of embroidery floss because it was the only thing I could find that was the right color. 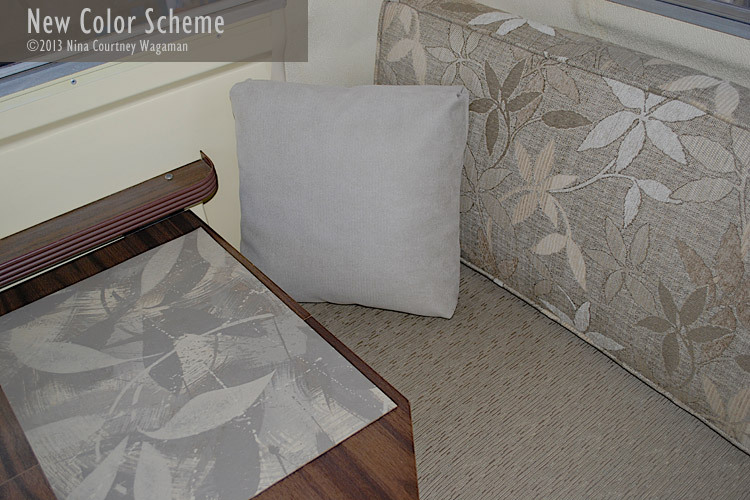 The headers are accented with welting made from the seat upholstery fabric. I waterproofed the small shade over the door window with spray silicone. Forty-five dollars, a bottle of glue, some scrap wood cut to size and painted, five beads from an old necklace, and three skeins of embroidery thread at thirty-seven cents… Voilá, lovely window coverings with a definite Zen feel. Peaceful. Simple. 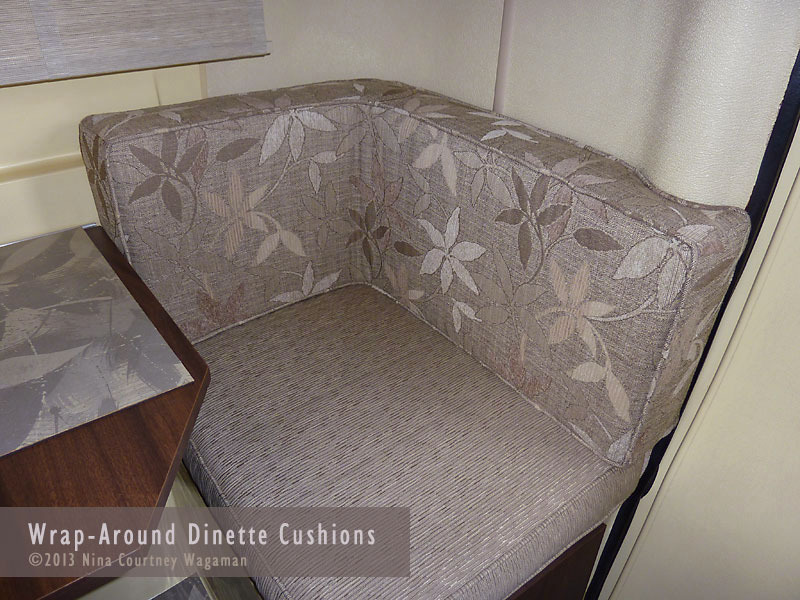 One of the trickier aspects of the new upholstery was a result of our decision to create wrap-around cushions for the front dinette. We assembled the foam shapes from “Q” foam we had left over from our boat cushions. It is very high quality material, expensive too, and we had saved all unused pieces. We glued slabs together to the size and thickness we desired, using spray adhesives. We used both 3M High Strength 90 and Loctite Professional. Each has a web spray pattern, which is easier to control. I found that I prefer the 3M product. We had used that on our boat headliners and it has held up well since 2004. We let the glue cure overnight, then cut wedges out where we wanted the cushion to make a curved right angle. 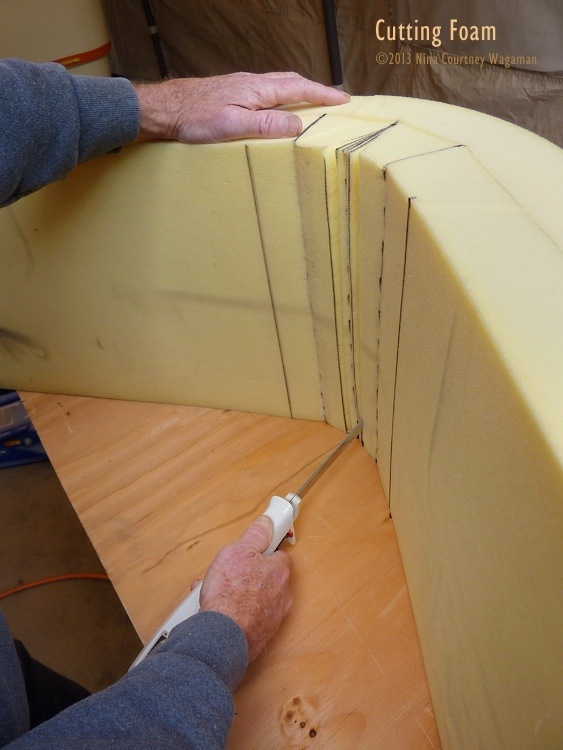 The first set of wedges weren’t deep enough, so we cut them larger and glued again, jamming the folded foam under some furniture to force it into a tight bond. Here is Clark cutting the foam with an electric knife that we found at the thrift store for fifty cents. And here is a finished corner cushion. This is the starboard one with the back shaped to accommodate the bump next to the door. This allows for a cushion the full width of the seat. On April 11th, together we hit the pavement, driving north on Highways 70/99 through Yuba City and Chico, joining I-5 at Red Bluff. This is “the scenic route”, more leisurely without the interstate’s many trucks and vehicles whose drivers always seem to be in a hurry. The day was clear and mild, a perfect day to enjoy the passing rows of flowering fruit and nut trees of Northern California’s “fruit basket” agricultural area. We were aiming for Valley of The Rogue State Park, just a bit shy of Grants Pass, Oregon. We wondered how well Zuzu would behave towing the Trillium through the winding passes and steep grades of the Klamath Mountains. This system includes the mighty volcanic Mount Shasta and the somewhat infamous Siskiyous. We were especially curious to see how she towed after we simplified the hitch setup by removing the trunnion weight distribution kit, which we felt was unnecessary for towing our Miss Trilly’s mere 1300 pounds. The driving proceeded beautifully and we enjoyed the sights along the way–our view of Mount Shasta was glorious. The traffic was remarkably light and our Trooper didn’t flinch with the trailer obediently following. It was much less bumpy and jarring towing without the weight kit on the hitch. We were able to pass the double-rigs as they negotiated the downgrades under low gear and slowed to a crawl on the upgrades. The going was comfortably smooth. Inside Oregon, we pulled off in Medford to fill the fuel tank at Costco, then drove on to the state park where we found a spot to spend the night beside the Rogue River. Unfortunately, the camping area is also flanked by the freeway on its other side. 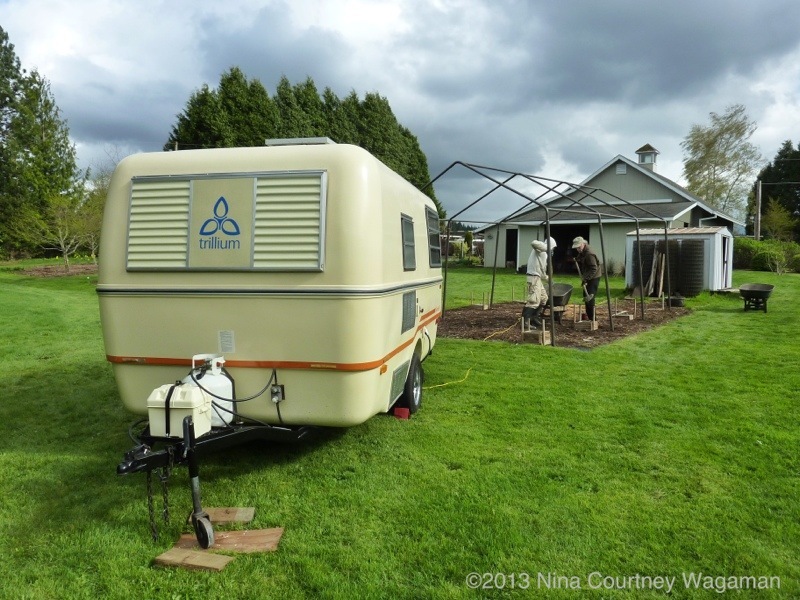 The trailer seemed to dampen the whoosh of traffic–we were glad not to be sleeping in a tent! Dinnertime. No propane. Hmmmm, we had tested it before we left. It had to be that the 34-year-old regulator decided to take that moment to give up the ghost. Cold chicken thighs with slices of Irish cheddar and Jarlsberg took the place of a hot chicken and cheese omelet that night. We slept very well on the custom mattress that came with Miss Trilly. I made up the bed with our fleece sheets and a “down alternative” throw (Don’t you just love that? It’s just Dacron, folks.) from Costco. It felt just like our berth on the boat or the bed at our studio in Sacramento–much nicer than sleeping bags. Without propane for the wall heater, we were fortunate to have electricity for the small space heater because it got very chilly. We had to wear earplugs to block out its loud fan and the freeway noise. In the morning, we went into Grants Pass to find a restaurant for hot coffee and breakfast. We admit with some reluctance that we ended up at Denny’s, where we split a Grand Slam with four eggs and four slices of paper-thin bacon. I looked up RV parts stores and, after a foray into the town’s nicely stocked Fred Meyer store, we pulled into a yard with dozens of new motorhomes for sale. The gal behind the counter told us, after we explained our regulator problem, that they would charge $44 just to “take a look at it.” We were in the wrong place! On the road again, we hadn’t even reached full inertia when we spied a small RV yard on the west side of the freeway. We took the off ramp immediately coming up and pulled into Oregon RV Outlet, where Howard sold us a new regulator for only $17. 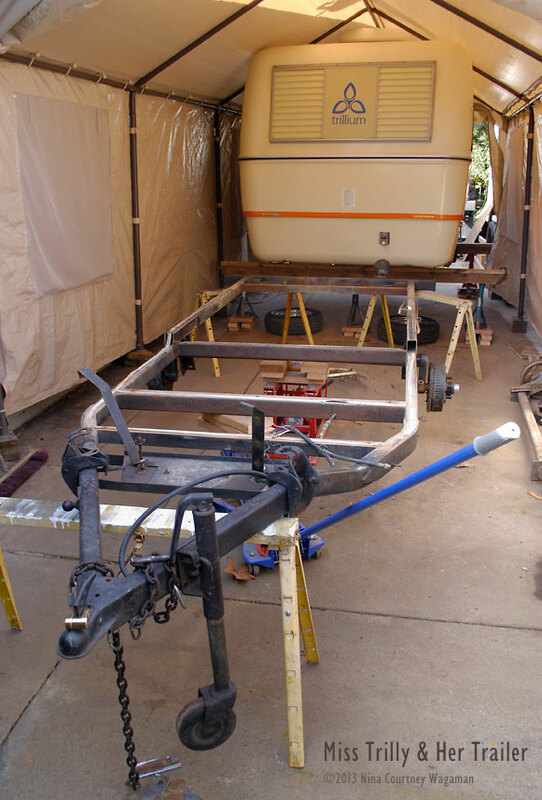 They were doing work on a very unusual vintage fiberglass trailer, one of only two made in 1969. The name on the side of this beautifully painted unit was “Experimental Grimm-Aero.” We have not been able to discover any more information. The Exit 99 (Canyonville) off-ramp took us to the only privately owned rest stop on the West Coast, Jordan Creek. It is on the Seven Feathers Casino property. It is very well appointed and it’s BIG. I learned the details about this new rest stop on the internet using 3G on our iPad as we drove away. This rest stop has only been open since autumn of 2012. A sign indicated that a maximum of twelve hours of parking is allowed. We marked it down as a potential overnight location. Next stop, the Salem Costco for gas. While Clark waited in line, I ran in to use the restroom. On the way, I noticed that they had the 10′ x 20′ carport we had purchased in Sacramento on display. If you are a Costco member, you will have learned to buy what you want the first time you see it in the store, because when you go back the item may be sold out. That is what we did with the shelter for Miss Trilly. Yes, we could have saved paying California sales tax, but we did not want to take the chance of Salem not having any available. Besides, we had to pack all our boat gear around that gigantic box. We arrived at my aunt’s rural home just after 4:30 p.m. My cousin and her husband were out working in the expansive yard. The weather was now cold and gray, quite a change from sunny, warm California. Rain was in the forecast, so the huge box that held the Summer Palace was immediately unloaded from the Trooper. We had the frame all set up and ready for footings before dinner. Easy. The men building forms as Miss Trilly awaits. Here we must leave Miss Trilly and you, our dear readers, for we are now back aboard our trimaran, Rikki-tikki-tavi, readying him for a full six months of cruising the Pacific Northwest. Clark and I will pick up where we left off when we return, put Rikki-tikki to bed for the winter, and begin our Great Journey with Miss Trilly. Until then, we wish all of you safe travels and wonderful adventures! Our “finish line” of having Miss Trilly ready for the road is coming into view. All the Hehr jalousie windows have been removed, cleaned up, and reinstalled. Originally, plywood strips surrounded the windows. Clark cut solid wood as replacements. The windows were attached into these using new stainless screws. The sealant, butyl “combo” tape generously applied, will stop any leaks for perhaps three more decades. We are elated that this undertaking is complete. My fingernails are completely worn down from all the scraping and steelwooling. Even though I strongly dislike cleaning aluminum, I enjoy seeing it clean and shiny. However, one can never remove all the corrosion and pitting. Just accept it. Removing the vinyl-faced Ensolite insulation from the wood strips inside the trailer was difficult and tedious. The cement used in 1979 stuck very well, especially on the wood that was not rotted. A very sharp thin bladed kitchen knife, I found, was the best tool. It was the point of the knife that presented a hazard – too easy to slip and make a mistake. I only poked through the face once when freeing a corner from the wood. Hopefully, I will be able to repair that small tear satisfactorily. I never want to have go through slicing Ensolite off of wood again, so we trimmed the windows with painted wood. This finishes off the contemporary look very well and holds the wall insulation in place, covering up any holes from previous window covering installations. In the spaces of time between cleaning windows and removing paint from the portside exterior aluminum (again!) 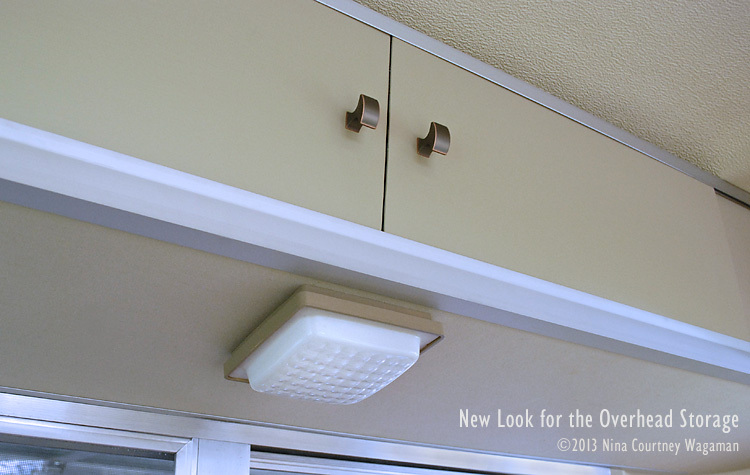 vent grills on Miss Trilly, I covered the bottom of the overhead shelves with Sunbrella®. The sticky coating on the mahogany skin, we discovered, originally held some kind of thin vinyl material. It is the same vinyl that is on the inside of the drawer stack in the aft seat and that had been applied to the two barrier boards that protects wiring, all of which is peeling off. This covering had dried out and come loose long ago and had been torn away. The remnants were still stuck along the edges where the shelves were held by the aluminum framing. Clark cut new sliding door panels out of scrap doorskin material we had on hand and painted these to match the window trim. We have reinstalled the shelves (correcting an egregious misalignment while doing so) and remounted the original under-cabinet light fixtures. These are updated with Valspar spray paint. I removed the brown-painted frame on the lenses with acetone and Clark replaced the lamps with LEDs. He found adapters for the bayonet fitting. 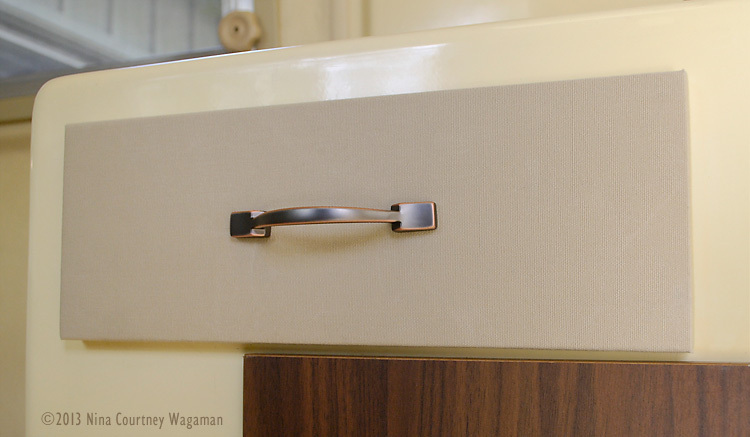 The doors now have contemporary knobs that coordinate with the original copper-colored/bronze latches. Today we finished the interior of the closet. The “rat fur” has been replaced by “medium neutral” EZ-Flex automotive carpeting, which I glued in with latex carpet adhesive. Clark cut a mahogany panel for the floor, coated it with polyurethane and I covered that too with the carpet. We painted the raw wood sticks that held up the white (!) vinyl-coated wire shelves that came with the trailer to match the carpet. The closet now looks modern and clean. The auto carpet is well-made stuff and will be extremely durable. The vinyl “wood” on the cabinetry is, unfortunately, in very good condition, with the exception of the top drawer. It was peeling badly, so I pulled off the vinyl. 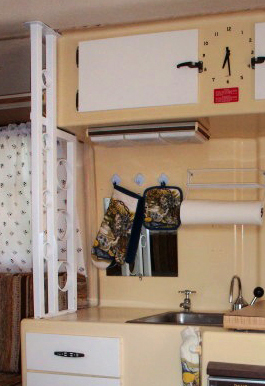 It may not work out, but I wrapped the drawer front with the same Sunbrella® that we used under the overhead shelves. We like how the fabric looks and hope that because Sunbrella® is scrubbable, we can keep it looking nice. The new pulls are elegant and they won’t catch on our pants pockets! Perhaps during the winter of 2014 we will have the gumption to makeover all the fake walnut particle wood doors. In truth, the original dark vinyl everywhere is looking very out of place now. We each worked through several more tasks. 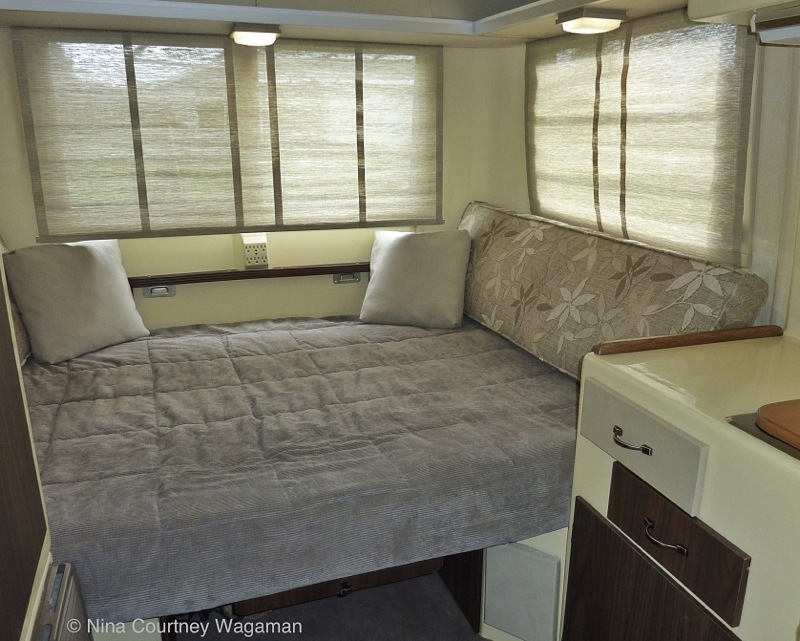 Clark installed two 12-volt receptacles, one under the forward dinette, the other above the power converter, which is original equipment. We haven’t decided where to put the Morningstar solar controller yet. The wood headers for the roll-up shades are painted, so I am assembling them and gluing a wood strip into the hem. We should be ready to hang these by tomorrow afternoon, Friday at the latest. We will have crossed a threshold when the window coverings are finished. They will look fantastic – very Zen. Here she is now – higher ground clearance and solar panel instead of AC. 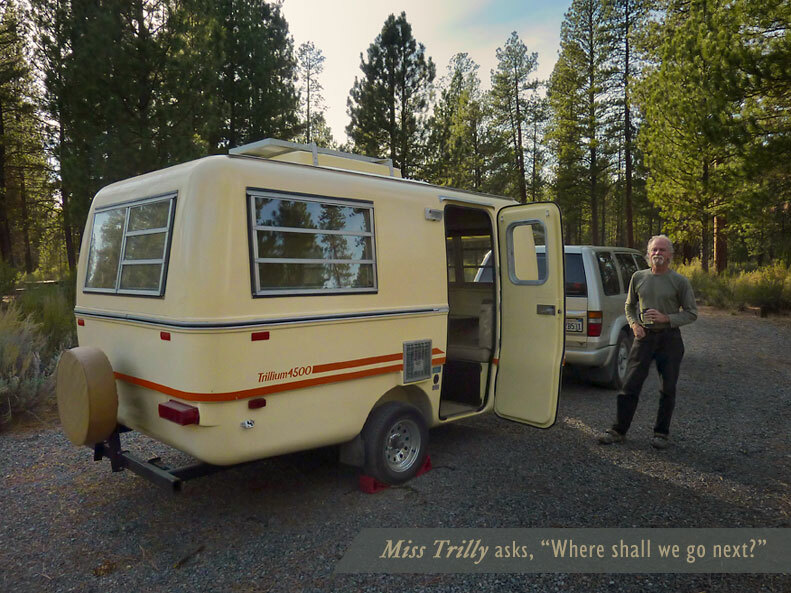 We will be storing Miss Trilly in Oregon for the summer. She will be watched over by attentive family, who generously offered to harbor our sweetheart. We deliberated for weeks with choices for a weather cover for our treasure. 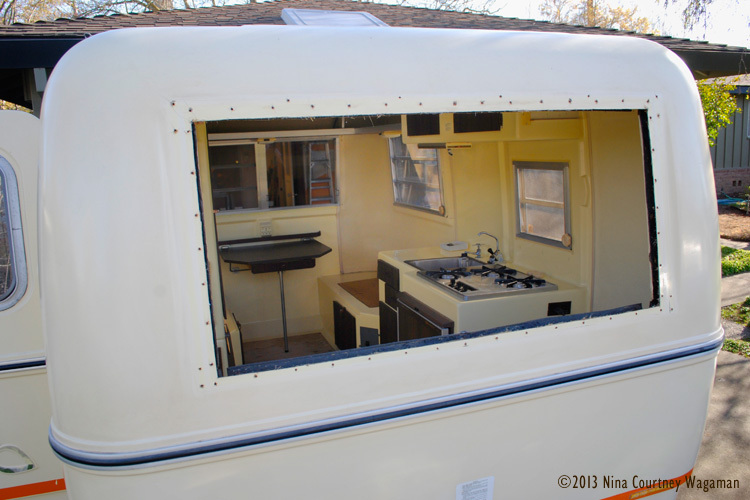 Should we buy a full RV cover, build our own carport from wood or steel, or buy a temporary shelter? Money always a consideration, we did not want to spend more than $300. A shelter like the one from Costco that protected the trailer while we worked on the new axle would be perfect, but these were no longer available at Costco. We checked each time we went, which is fairly frequent when we are in California. Finally, on a visit just last week, we saw an employee atop a display assembling a large patio umbrella, so we asked him if they were expecting any of the carport shelters Costco had stocked in the past. He lead us to a stack of them that had just that morning been delivered! A very heavy box is now taking up a lot of room in Zuzu, our tow vehicle. Miss Trilly will be protected like royalty during her sequester in Oregon. We breathe easier now, another item checked off the list. The finish line is in sight! Everything is coming together quickly now. We are getting antsy to hitch her up and be on our way! Photographs will be posted of the new and improved Miss Trilly as soon as they are available! We had been making very good progress with updating Miss Trilly and were hopeful of getting on the road headed north by the middle of March. Here it is March 20th and we find our Trillium waiting patiently in the driveway as we perform needed maintenance and modifications. 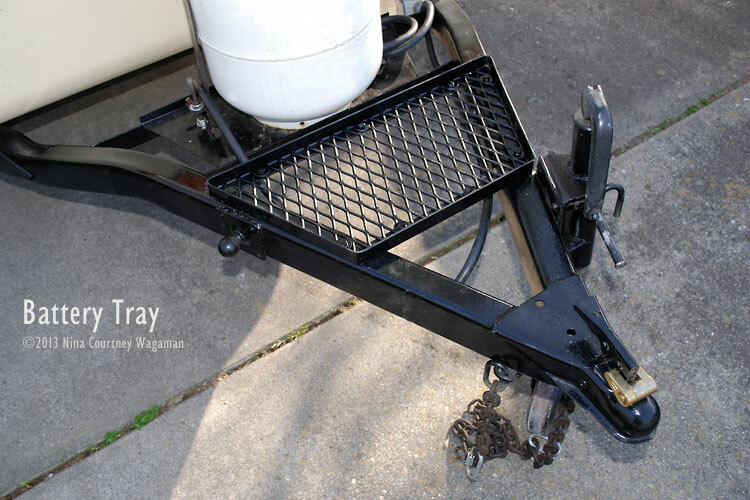 We had finished all the new upholstery, made the floor cloth, welded on a new axle, built a battery tray on the tongue of the frame, and removed the AC unit. Clark was sealing up the hole in the roof with a piece of fiberglass. We ordered a solar panel and Morningstar solar controller. I was looking for something else to do while Clark completed the solar installation. I would cover the underside of the overhead shelves with Sunbrella! The shelves are mahogany door skin material that is coated with some uneven sticky varnish. When I took down the mini blinds, the wood delaminated where the mounts had stuck fast. I asked Clark where the square-head screwdriver was in order to remove the forward shelves. Next thing I knew, he’d taken down the all the components himself and had the Ensolite pulled back from the window frames. Horrors! The wood into which the window is attached to the trailer with screws was rotted through. We were certain that the windows had never been pulled out, that the plywood had never been replaced. However, we thought we could get away with waiting until next winter before tackling that big project. It was glaringly obvious that the wood needed replacing before we left for points north on our trimaran. So we are delayed. While I very carefully peeled all the Ensolite away from the rotted wood surrounding the window, Clark took off the front window guard. He then removed the forty screws that held the window in place, laying it on a worktable for me to clean. We were shocked at the lack of sealant! It was practically nonexistent. I cleaned up the gelcoat around the opening. Clark borrowed a table saw, set it up in the driveway next to the trailer, and cut solid wood for all the windows. 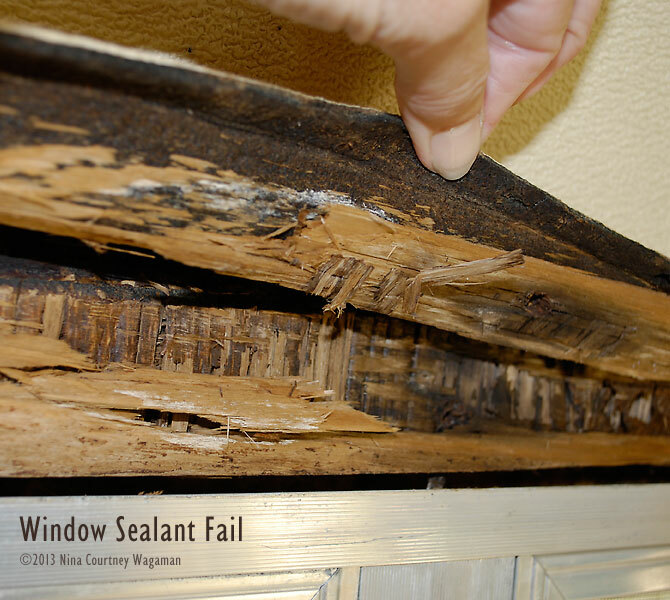 We may as well the replace wood and reseal all the windows, right? After two days of cleaning aluminum, which I have grown to dislike very much, we were ready to reinstall the first window. With the new stainless screws and butyl tape (which we held in the refrigerator until ready for use), we are confident that the window is now sealed against the weather. It is no longer another thing that we know needed doing that we didn’t do. It will be done and our minds will be free. After four more windows, that is. This is a very intriguing mystery, for us at least. Perhaps it will also be compelling to other vintage Trillium owners out there. When we wrote about Miss Trilly’s unique pink-colored ironwork on her Attributes page, we were under the impression that Trillium didn’t have supports between the galley countertop and cabinets or between the countertop and the ceiling. We had never seen even one photo of a Trillium with a support between cabinets. In truth, we felt that the thin, twirly iron supports in Scamps were rather unattractive. Our reaction to the gargantuan structure possessed by Miss Trilly, when we first saw it, was one of distaste. The existence of iron braces, we believed, was unique to Boler fiberglass eggs, among Canadian-built trailers, and to Scamps. When we visited the Trillium RV factory in Florence, AZ, in January, we asked Tom Young about the ironwork in our 4500 w/AC. Without seeing our Trillium, he immediately responded, “You have a Boler!” He told us that Trillium “never” put supports in their trailers. “They don’t need them because of how they are constructed.” Subsequently, it was our theory that this prominent piece of metal (painted PINK! omg!) had been added by an owner somewhere along the line, perhaps because they’d been concerned about the 82 extra pounds of AC on the roof. 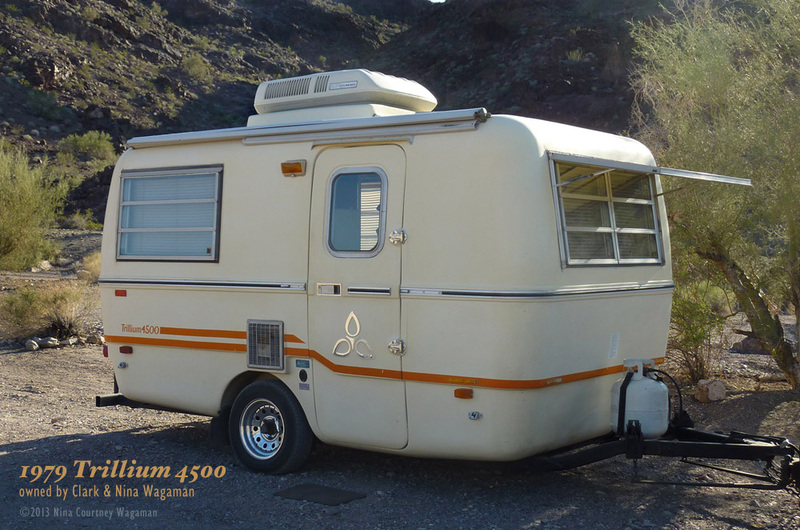 Like everyone who acquires a vintage trailer, fiberglass or not, one begins to seek out other examples of said trailers. So, unable to sleep one night, I lit up our iPad and began cruising through Google® images under the search “Trillium 4500”. 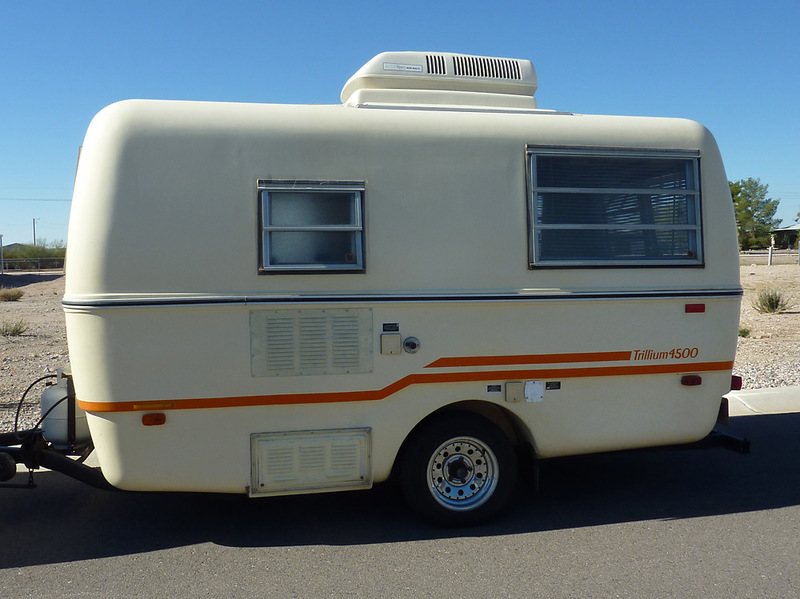 To my great surprise, what should appear but another “very rare” 1979 Trillium 4500 with factory installed roof top air on Fiberglass RV Classified Archives. Two years ago, this Trillium was located in Missouri and the seller was asking $7500. As I scrolled down the page, I was amazed to see, revealed in the photos of the interior, a twin (!) of our heavy-duty ironwork, except this one was painted white. Wow. Our theory (and Tom’s assertion?) was derailed. I almost woke Clark to tell him, but restrained myself and decided to wait until he was enjoying morning coffee. Where does this new revelation leave us? Were these twin supports installed by Trillium as the campers with AC were being manufactured in Ontario, Canada? Or were both of these structures installed by a Trillium dealer? The same dealer would have had to sell both trailers, don’t you think? We inherited a binder containing the paperwork and history kept by various owners of our 4500. The original Owners Manual and Warranty Card (in French), is dated 30 November 1979. The dealer on the card is Camping On Wheels in Irvine, California. We wonder if the 4500 in Missouri with matching ironwork (wondering, too, where the trailer may currently be) was also sold through this particular dealer. All very interesting questions, which serve only to deepen the mystery of the ironwork. Should you be able to provide a clue to help solve this mystery, please let us know. Miss Trilly has a new axle and a perky posture, standing quite proud as she shows off her higher ground clearance. Her wheels no longer cant outward as they did on the original axle that carried her for thirty-four years. Trilly fairly shines with newfound buoyancy and satisfaction. Her trailer is flashing a fresh black gloss. Even the bolts on her wheels reflect the new attitude. Here is the story as it played out. First, Clark borrowed two floor jacks and four jack stands, collecting these at the designated place of Trilly/trailer separation. Then, he summoned my help. It took the two of us to remove the eight bolts that held Miss Trilly to her trailer. 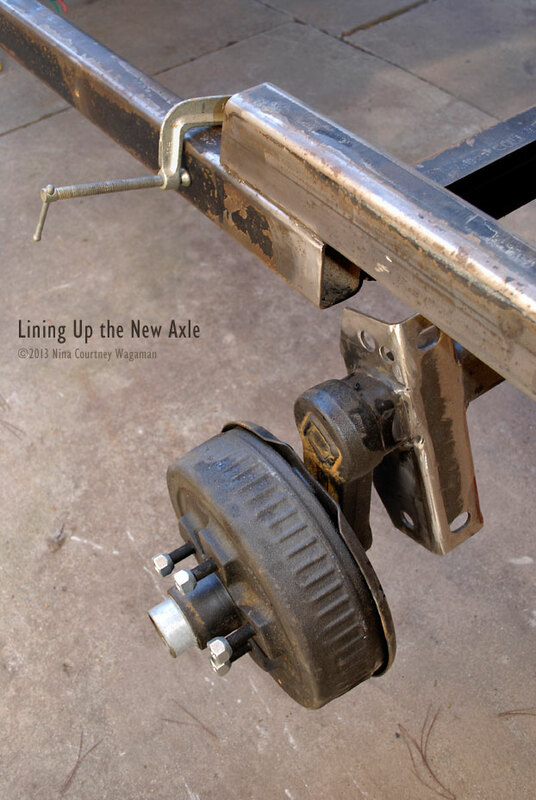 I gripped the plate and heads of the bolts from inside the trailer, using channel-lock pliers, while Clark applied torque from underneath with a socket wrench. The bolts were very difficult to remove. Two of them, being rusted nearly through, broke completely in half. Only one, the fastener located inside the aft port bin under the drawers, came out with some measure of ease. After we removed all of the bolts, I left Clark to remove the “egg” from its trailer, which he accomplished by himself. Clark cut and ground off the old axle and then prepped the metal to receive Miss Trilly‘s replacement axle, a Dexter #10 Torflex with -22.5˚ starting angle. Here is a photo of the new 53-inch axle lined up with the rails of the trailer. It is quite a bit heavier and beefier than the original unit. We found a local welder with a mobile unit on Craigslist. His professional-looking website, thirty years of experience, and $50 per hour quote gave us the confidence to trust that he would do a great job. Howard Whipple says, “Trust the welder. 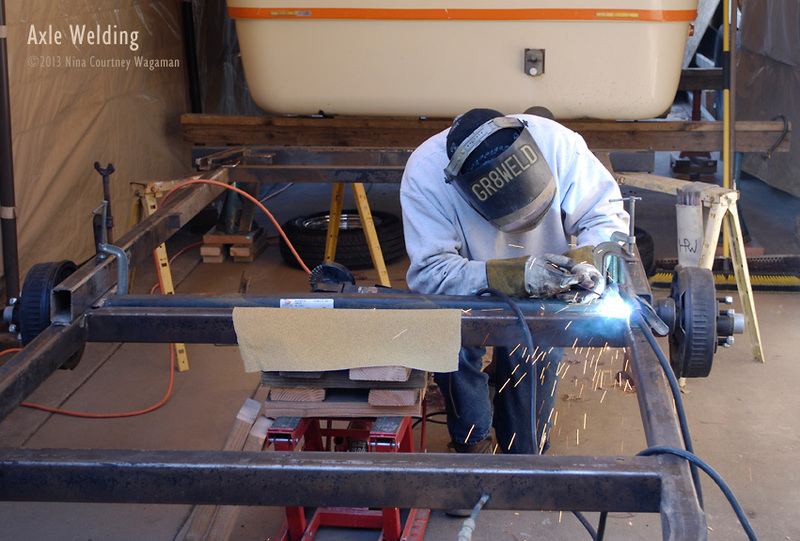 Trust the weld.” We were ready when he showed up on time Monday morning. We are extremely pleased with the workmanship. 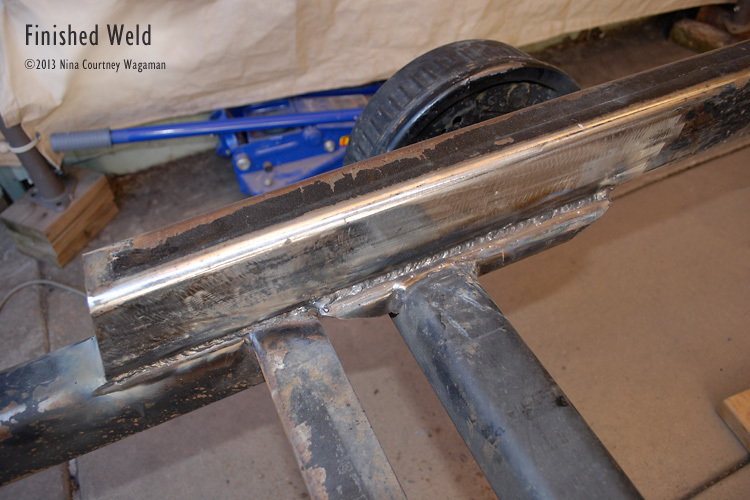 The new axle is welded on MUCH more thoroughly than the original. Howard left no joint unwelded. 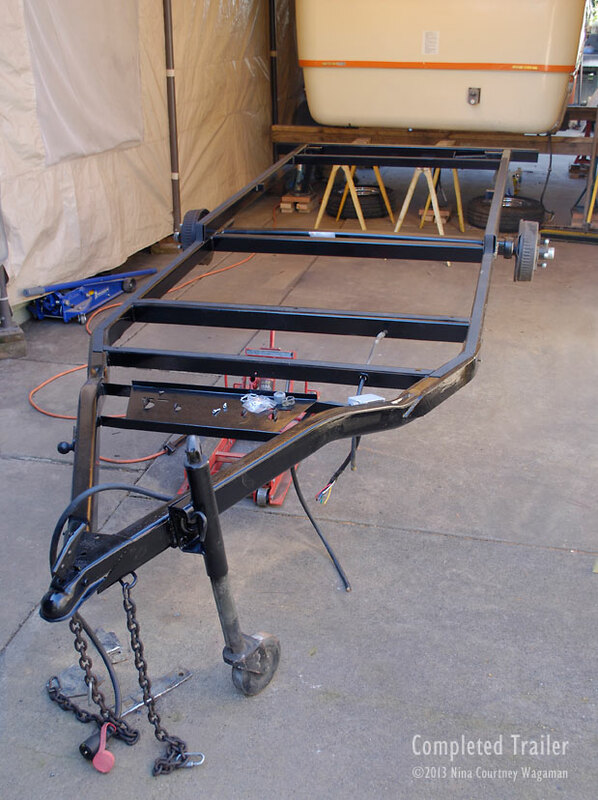 Clark cleaned up the remainder of the trailer frame, removed minor rust, primed and painted the rails, tongue, and cross members. He applied a clear-coat for additional protection. Trilliums originally had foam tape on the rails of their trailers. We wanted something with a bit more substance. There is a funky metal surplus store in our area called Blue Collar Supply. On our last visit, we saw stacks of neoprene sheets of varying thicknesses, priced incredibly low. Clark picked up a large sheet for less than $6. I cut strips 1.25″-wide, which we spot-glued using Shoe Goo. It is visible in this photo of the freshly painted trailer and axle. This is the newly refurbished trailer, complete with an updated waterproof electrical box on the port forward rail. It is ready to receive its “egg” cargo. We are pleased to present the updated and lofty Miss Trilly! I spent a lot of time looking at choices for new floor covering for Miss Trilly–too much time. As part of the search, I sent for carpet tile samples from Flor.com. One of them was the perfect color–Porpoise–a soft taupe brown. We calculated how many 19.7″-square tiles we’d need to install. It was immediately obvious to us that we could not justify spending $300 for such a small area, no matter how nice it was. We continued to brainstorm for few more days. Nothing we researched seemed affordable, the right color, or the right look. As mentioned, we didn’t want to glue or tape anything down to the gelcoat and whatever we chose had to “work” with the design. Aesthetics are as important to us as function. At a local carpet warehouse, I found a lovely commercial carpet remnant with a low, textured loop. It was, in fact, gorgeous. The piece was 12′ x 15′. We needed only 48 inches of it, but the owner declined to cut the remnant. Disappointed because I was truly hoping that I’d solved the dilemma, my head went back to working on a less expensive solution for covering the floor. At dinner that evening, the answer came to me. I had been a commercial studio photographer for many years and I had always painted my own backdrops. Though I retired back in 2003, I still had all the canvas backgrounds and custom paper drops I’d created over the years. I knew there was one on very heavyweight canvas that was at least six feet wide. We pulled it down from on top of our kitchen cabinets where it was rolled up and laid it on out the bed. Measuring, we found it was just long enough to make into a custom floor cloth! While it seemed a shame to paint over the very attractive background, I was already envisioning what the new floor cloth would look like. It would be good to put the canvas to a new use that we would enjoy looking at when traveling with Miss Trilly. Days earlier, I had selected some paint colors that coordinated with our fabrics. All I needed to do was buy the paint and get to work. Next day, I drove to Home Depot and had the “paint master” mix sample pots of two colors, with an additional color that matches the gelcoat for use later on. She color-matched my swatches of Glidden GLN29 “Soft Suede” and Valspar ar721 “Liberty Bell”. These are the only two colors I used to create the floor cloth. The total cost of the paint was about $6. The canvas was free, given to me by an artist friend decades ago, painted and used by me as a photo backdrop, now to become part of Miss Trilly‘s interior makeover. My friend was pleased to learn that we will enjoy her gift for many more years. Taking a deep breath, I plunged into the project. Over a few days’ time, I layered up the paint colors. First, I brushed on a thinned base coat with the darker shade and let it dry overnight. Next, I used a 4-inch brush to apply broad strokes with the lighter shade, mixed with the darker paint to tone it. Dry brushing a bit over these shapes gave them a more random look. I splattered on some paint and drew some quick curving lines with the darker shade to add even more randomness. We all felt the “rug” was looking pretty good at this point and could have left it there, but I wanted to take it a step further. 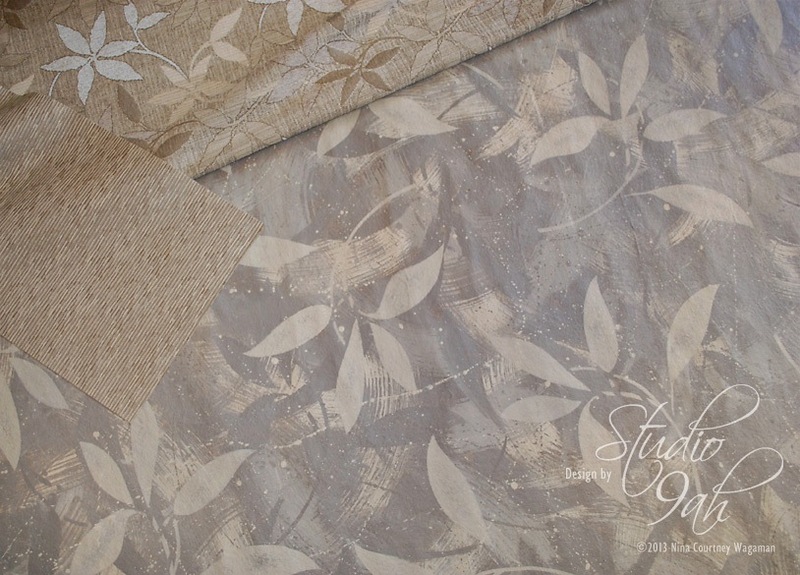 Stepping back to contemplate the design, I decided to repeat the leaf design from the Barrow fabric we are using. I began by drawing a freehand version of one of the clusters onto heavy building paper and cutting a stencil. I began by stenciling the leaves in the darker shade, alternating the direction of the cluster. After an overnight period to dry, I layered on a stencil of the lighter shade, also toned down, dry brushed a bit for texture. The finale was a another splattering of the lighter shade. Today, I am coating the painted floor cloth with Rust-Oleum Ultimate Polyurethane, matte finish. I took a photo of the finished cloth with the fabrics that inspired the colors and design. We are very excited and can hardly wait to see it in place inside Miss Trilly! We will have to be patient. The trailer is very high off the ground, up on jackstands and wooden beams. Her trailer has been rolled out from under her. Clark cut off the old axle and has cleaned up the trailer, which is in very good shape considering its age. 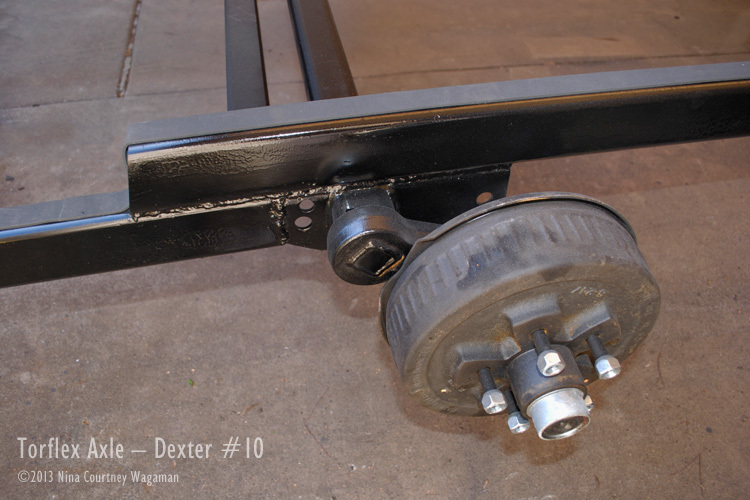 The welder will come on Monday to install the new Dexter axle. I must wait until the trailer is back on her frame to get inside and fit the new cloth to the floor. Once it is cut to shape, I will be gluing on a felt backing and folding back a hem to finish the edges. Meanwhile, I will be working on sewing the new upholstery for the back cushions. Text and photographs included in these pages are copyrighted to Nina Courtney Wagaman and/or Clark Wagaman, except where noted. You may NOT use either media on your website or on another website without express permission. However, you MAY quote a short excerpt with a link back to this website. Thank you very much for your interest. Join the LCHF movement in Sweden!